For those of our readers in the Worcester County area, a sad day has come. 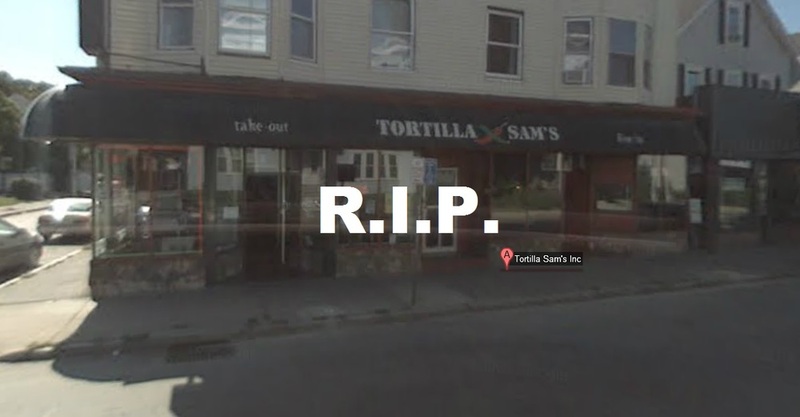 Popular Mexican restaurant Tortilla Sam’s, a place of such renown that words like “Landmark” and “Institution” don’t do it justice, has closed. Having lived in the area for over 25 years, I can’t think of a time when it wasn’t there on the corner of Highland and North Ashland, it’s giant lit up pepper sign illuminating the block. Now I realize that there was a time when this wasn’t the case, possibly even in the past 25 years as I was a child for some of that I don’t remember everything, but definitely 10+ years. But I come to bury Tortilla Sam’s, not to praise it, for it had some of the strangest and worst nachos I’ve ever had. Conveniently located between the campus’ of Worcester Polytechnic Institute and Clark University, Tortilla Sam’s was a funky little Mexican place with fantastic ambiance. Always packed with college students, it was one of the few places around offering a BYOB service, which only added to it’s charm. If you wanted a lot of Mexican food for cheap, and as a college student when didn’t you, this was the place to go, unless you wanted good nachos. Their nachos came in two varieties; Nachos for One, and Huge Nachos. 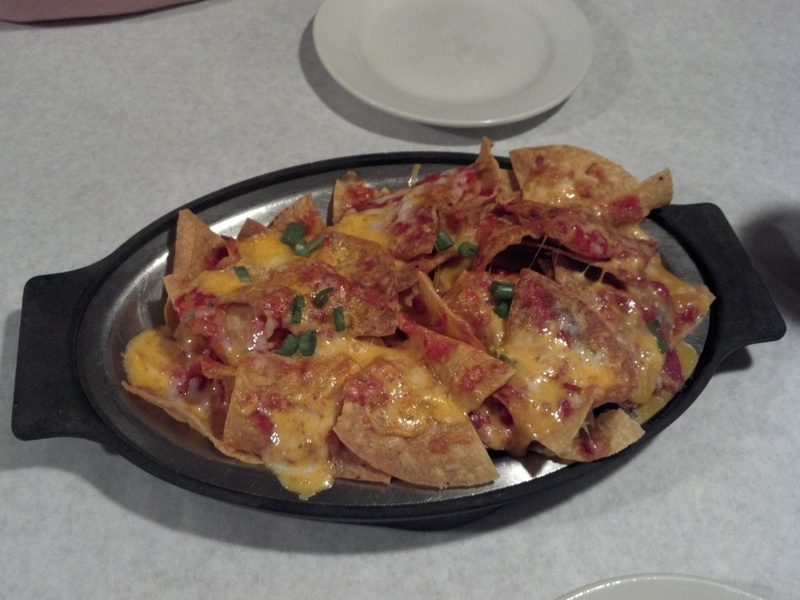 The former holds a place in my heart as being my worst nacho experience, and the latter being the strangest. Jack Cheese, Cheddar Cheese, Salsa, Scallions. I don’t know how many nachos I’ve eaten in my life, but there was only one I wasn’t able to finish, and it wasn’t from Taco Bell or in a box at Target. It was this bad boy. Imagine if you were a chef. You took chips, melted cheese on them, added salsa and scallions, put them on a plate, but then while you were transporting them to the table they slid off the plate and into a sink of water. you pulled them right out, but the easiest way to get them dry was to throw them on the grill. So you end up with nachos that are cooked, but strangely damp, and covered with grill marks like a hamburger at a BBQ. Totes gross. Now, I’m not saying that this is what happened to my order, but it sure seemed like it, so I didn’t finish them. Am I ashamed that I couldn’t? Not at all, they were pretty bad. Unfortunately their other option I don’t have a picture of, and now never will, because like a vampire it can’t be photographed, or I had it before the idea of Nachonomics was a thing, your choice. As part of their awesome marketing campaign of these as “Huge Nachos”, instead of just bringing you a larger pile of nachos than their “Nachos for One”, they just brought you two plates of the smaller version. Genius? Perhaps not. But clever? Definitely. It looked something like this, but covered in more strange stuff. And possibly zucchini and broccoli as well. If there is any justice in this world I blocked those out and all I have now are vague memories of them on there. Now I don’t happen to like those vegetables much, but I can be objective and realize that some people might. However, even if people do it does not mean that they’re ok to put on nachos, because they’re not. Those are the kind of vegetables that belong in a steamed side when you order a side of ribs and don’t want the potato side. You make nachos with specifically selected items, not by dumping out your vegetable drawer and chopping it into toppings. So yeah, don’t eat these nachos, and even if you wanted to for some reason now you can’t, which is fine because you wouldn’t. That being said, Tortilla Sam’s was a funky place, even if it was constantly understaffed and the nachos were poor. It’s a shame that it’s gone, but perhaps these ashes with give birth to a magnificent phoenix. A phoenix that serves good nachos.